Moran Yacht & Ship sends word of a further €600,000 price cut on their listing for sale, the 31.1m motor yacht Muse. Built by the Italian yard Cantieri Navali Cerri to RINA class as a fast sports yacht, Muse was delivered in 2012. A large main saloon has two settees, occasional chairs and a 50 inch motorised LCD television screen plus a Bose surround sound system. Forward of this is a formal dining area for six, crystal and crockery storage cabinets and a wine cooler. Accommodation is for up to nine guests in four staterooms. The master suite has a double bed and a 52 inch LCD television while the VIP is also a double and has a 32 inch LCD television. To starboard is a further double stateroom, while aft there is a twin cabin plus a Pullman berth. All staterooms have en suite bathroom facilities. 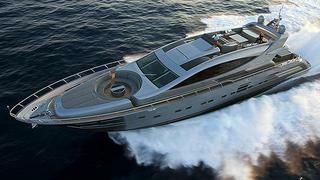 She sports a deep-V hull design, and twin 2,636hp MTU engines power her to speeds up to 38 knots. Muse is now down from €6.5 million to €5.9 million.